In my earlier post “Tutorial: Web Server with the ESP8266 WiFi Module” I used the ESP8266 WiFi module to run a local web server. This is a cool way to control devices inside my network. But to use that web page from the internet, I would need to open up my router which I don’t want to do for obvious reasons. Why not going the other way: host the web page in the internet, and have my board communicating with that internet page? This is exactly what this hype around IoT (Internet of Things) is all about :-). 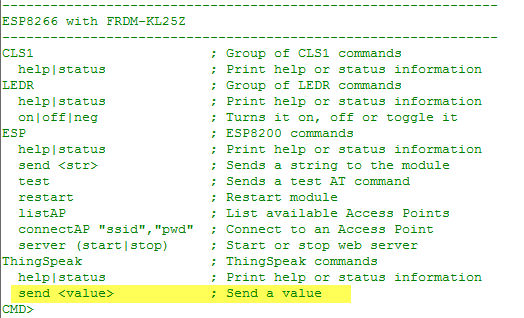 In this article I continue to use the foundation I have made in my earlier “Tutorial: Web Server with the ESP8266 WiFi Module“: The FRDM-KL25Z board with the ESP8266 WiFi module. 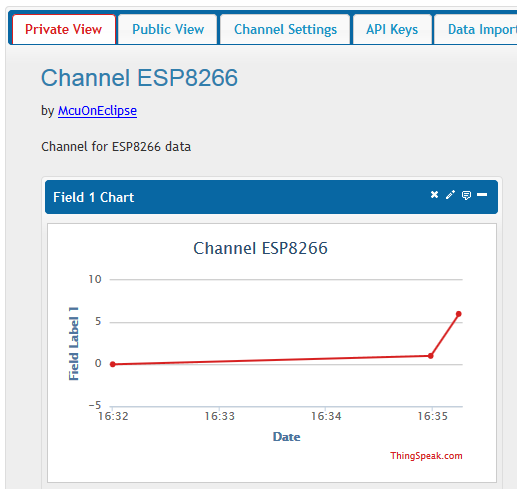 I stumbled over ThingSpeak (https://thingspeak.com/) while searching for an IoT cloud platform where I could store my data. There are many ones available, but the this one really stand out in my view: open, free and good infrastructure, including visualization tools. :idea: There is another IoT data server which I recommend to look at:https://data.sparkfun.com/. This one is simple and easy to use, but does not come with visualization out of the box. Go to Channels and create New Channel. 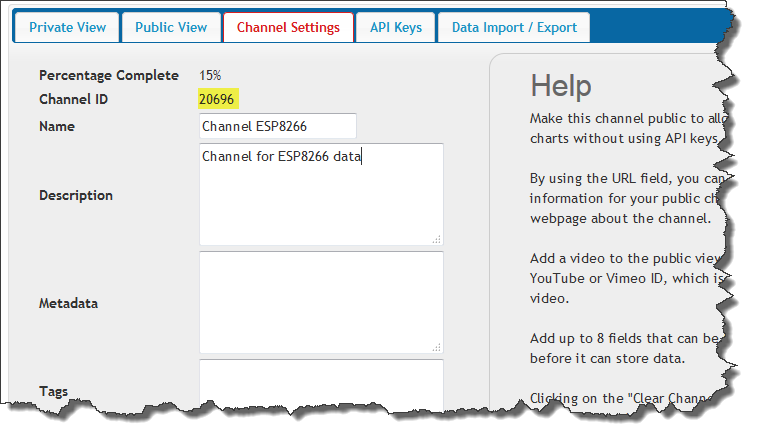 It will assign a Channel ID (we will use later). Provide a name and description. You can leave the other fields with the defaults for now. Press Save at the bottom of the Channel Settings page. Go to API Keys: it has generated an API key we will use in the communication. Now all what is needed to get the ESP8266 to connect to the ThingSpeak server and send the data :-). First, let me show the command sequence using the command line shell. :! : The size needs to include/count the “\r\n” at the end of the string! The GET command sends the data. 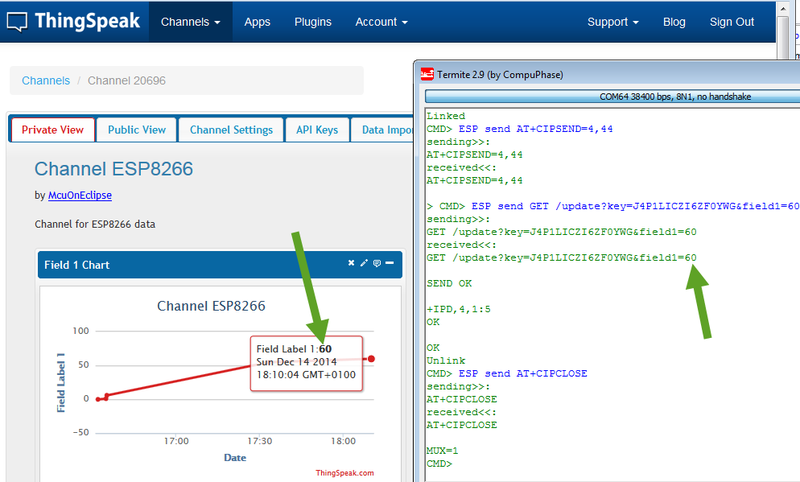 ‘/update’ is the command to the data site to update the data points, followed by the API key, the field name and the value (60 in my case). Because sending the data with the command line shell takes time, it makes sense to automate it in a function. 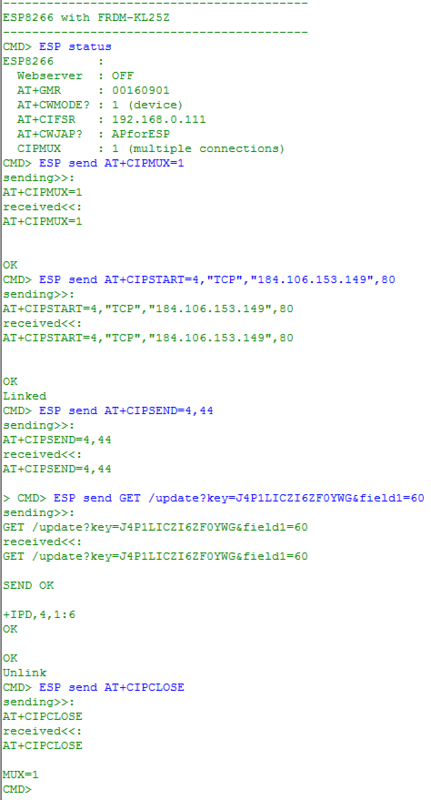 ESP send AT+CIPSEND=4,44                           // size with \r\n! With the right steps and know-how, it is really easy to send data to the internet and host it on an IoT server. 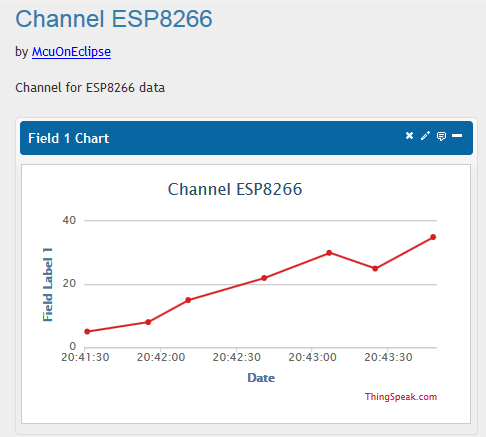 I this example I used ThingSpeak to post data points and visualize them, but any other IoT host can be used. ThingSpeak has other API’s, plugins and apps which can be used for different applications, e.g. tweeting messages to Twitter, line up requests at predetermined times or execute queued commands. I guess I have to explore all this in the next days and weeks :-). The project and sources for this tutorial are available on GitHub:https://github.com/ErichStyger/mcuoneclipse/tree/master/Examples/KDS/FRDM-KL25Z/FRDM-KL25Z_ESP8266_ThingSpeak.